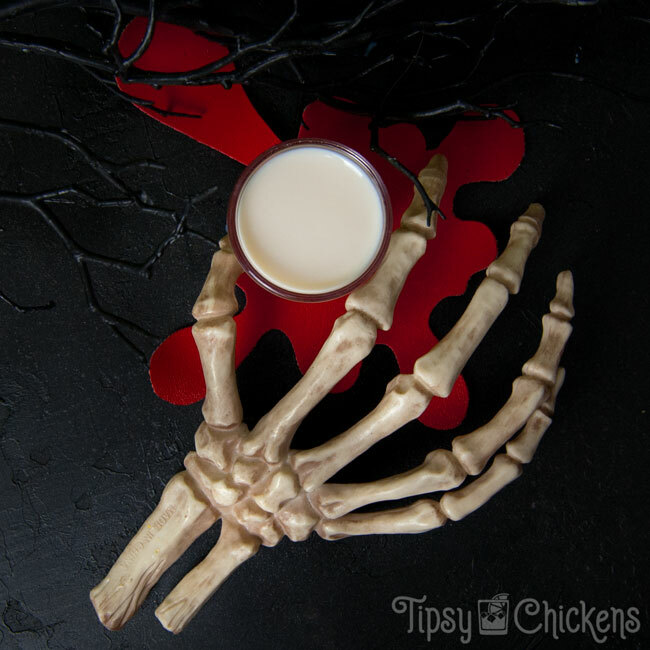 The Nightmare Before Christmas is an iconic Halloween movie and it deserves to be recognized with a boozy beverage. I nominated myself and I think it turned out pretty damn delicious. Please do some stretching, the story behind this recipe contains some serious reaches. 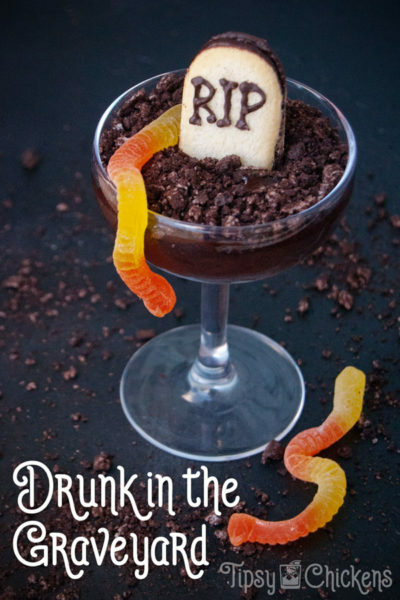 Earlier this year I made a batch of Sally inspired sugar cookies so I turned to Jack Skellington for this drink. After the big Halloween celebration the sax player calls Jack “Bone Daddy” hence the name. Side note, wasn’t that a cologne? I remember I wore the feminine counterpart ‘Ragdoll’ when I was super cool in high school… PS. Just googled it and you can still get it from Hot Topic! I decided on a shot for a few reasons. One, Jack is a busy guy. He’s making snowflakes and sewing a Sandy Claws suit. He doesn’t have time to be sipping a cocktail. He needs a drink you can make and drink in a hurry. Also, shots are party drinks. 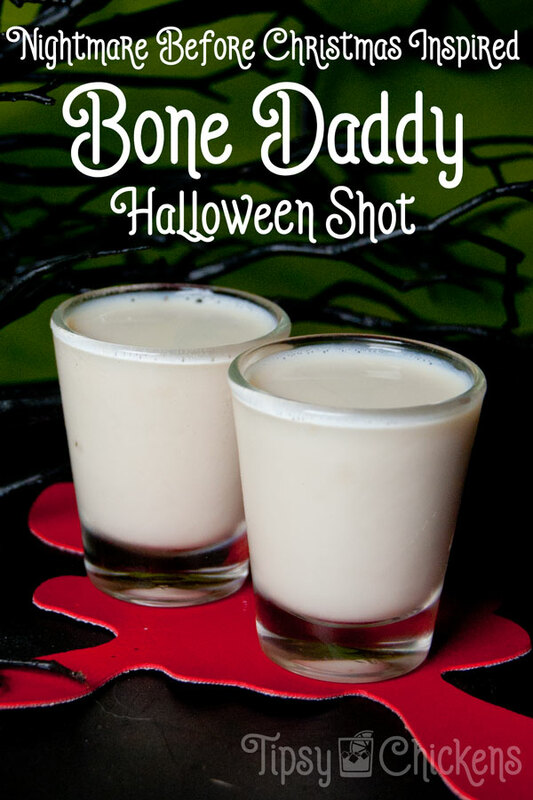 Aside from me, most adults aren’t hanging around doing Halloween shots alone on a Tuesday. You can scale this recipe up for a party with no issues. The math is easy, even if you’ve been drinking. All you’ll need is a bottle of black rum and a bottle of cinnamon creme liqueur. RumChata is the most popular but there are other kinds available, usually for cheaper. If you’ve never had it, RumChata tastes like Christmas morning. 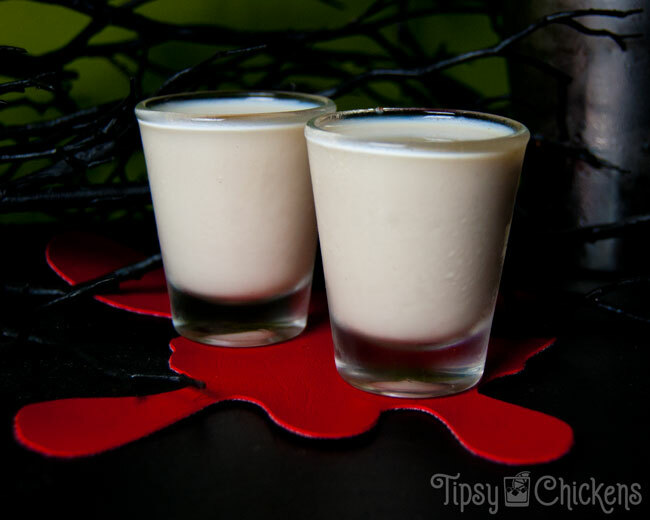 It’s a smooth rum-based cream liqueur flavored with sweet cinnamon. We’re going to corrupt it. Black rum is.. a meaningless term? In general it’s dark rum with a strong molasses flavor. I used Bacardi Black Rum. Mixing black rum and cinnamon cream liqueur takes down the sweetness and makes the Halloween shot a little stronger. It’s also gonna make the RumChata more palatable for those of you who aren’t a fan of sweet booze. Shake together RumChata and Black Rum over ice. 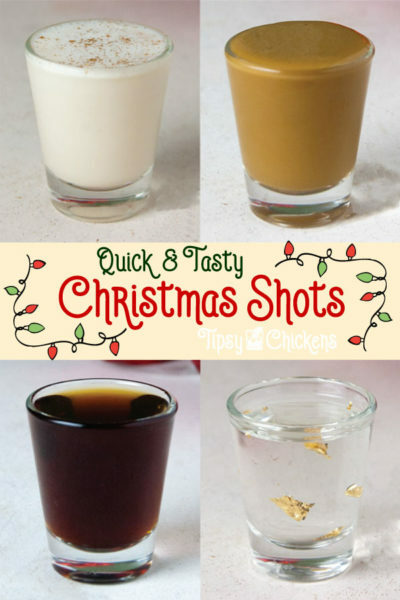 Strain and serve in shot glasses. It might be a little foamy from the milk content in the RumChata but I don’t mind and I’d rather shake a drink than stir it. Don’t forget to save this to your Halloween Party board! Dramatically sing 'This is Halloween"